NASA's Juno spacecraft is 30 days before its first launch window opens. "The launch window is the length of time allotted every day for an attempt to launch the spacecraft," said Jan Chodas, Juno project manager from NASA's Jet Propulsion Laboratory in Pasadena, Calif. "The launch period is the period of time in days when everything is in the right place to get your mission off to the right start." For a mission like Juno, getting everything in the right place includes considering the size of the rocket and spacecraft, where our home planet -- and in particular Juno's launch pad -- is pointed at any moment, and its location in space relative to other celestial objects like Juno's final target, Jupiter. "One month from today, our first launch window opens at 11:34 a.m. EDT (8:34 a.m. PDT) and lasts 69 minutes," said Chodas. "Our primary launch period is 22 days long, and so if weather or other issues come up on Aug. 5, we have 21 more days to get Juno flying. 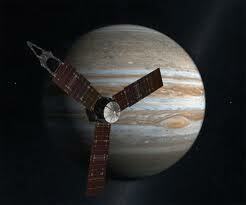 Once we get Juno into space, it's a five-year cruise to Jupiter." Juno is scheduled to launch aboard a United Launch Alliance Atlas V rocket from pad 41-C at the Cape Canaveral Air Force Station, Fla. The solar-powered spacecraft will orbit Jupiter's poles 33 times to find out more about the gas giant's origins, structure, atmosphere and magnetosphere and investigate the existence of a solid planetary core.